I'm running Win 7, home premium, 64 bit. I'm trying to set up file associations. I went to the control panel and opened file associations. The .xls file type (Excel) is not listed. Any idea how I would get it included? I got an .XLS file sent to me and I can't open it without saving it and opening Excel to get it. Which version of Excel are you using as files with the .xls extension relate to Microsoft Office 2003? Later versions have the file extension .xlsl. Download and install the Microsoft Office Compatibility pack to see if that helps. Very strange, if you installed a standard version of Microsoft Office. It should have automatically added default file associations for both XLS and XLSX to Excel. Change the program that opens a type of file. If you double-click a file in Windows and it opens in the wrong software program, follow these steps to choose the program you would prefer to use. You can change this setting for an individual file, or you change this setting so Windows opens all files of the same type in the software program you choose. Open the folder that contains the file you want to change. Right-click the file you want to change and then, depending on the type of file, either click Open with or point to Open with and then click Choose default program. Click the program you want to use to open the file. 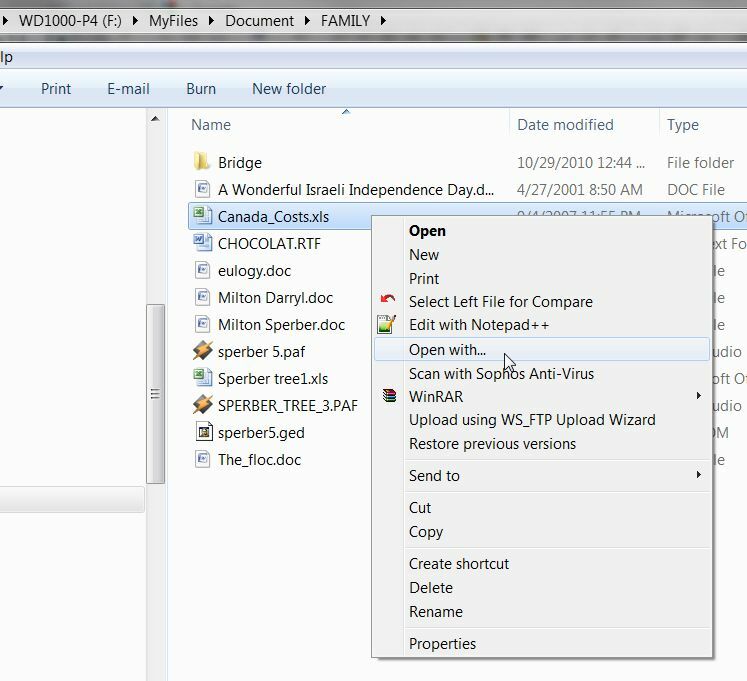 If you want all files of that type to open in the same software program, select the Always use the selected program to open this kind of file check box, and then click OK. If you want only that file to open in the software program this one time, clear the Always use the selected program to open this kind of file check box, and then click OK. I would like to have the .xls file listed as now I'm using Open Office instead of an old Excel. How do I get it listed in the file associations list? XLS is not currently listed. As was described above in the HELP snippet shown, you just need to use the "Open with..." dialog to set the default program to be used anytime you open an XLS file. Click on that "open with..." item, and you'll get a new window that allows you to pick the appropriate program to be used for opening any file of this type. If the program you want to use isn't shown in the list populated by Windows, you can push the "Browse" button to navigate to the appropriate program and select it. 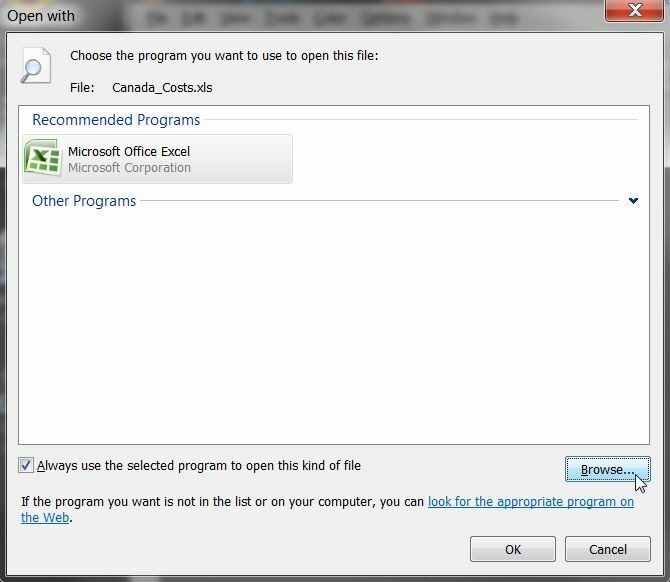 There's also a checkbox, to designate whether or not you want the program you just selected to be used to open this file to be used for (a) just this one particular file, in which case you'd un-check the "always use..." item, or (b) ALWAYS use the designated program for a file of this type, in which case you'd check the "always use..." item. I believe this process should probably establish an entry in the "Default Programs" list for the specified file type, if there wasn't one already there before. If you haven't installed Microsoft Excel, then its file associations will not be listed. As you are using Open Office you could download the Excel Viewer and use that to view Excel files. Thanks. I saved the file that came in with that came in the email and did as you suggested and opened the file a selected the Open Office app and specified that files like this should be opened with this app. It worked and I checked the file associations and sure enough .xls was now included with Open Office as the designated opener. Glad to be of assistance, and that your problem is now resolved.